Over the past couple of years I have enjoyed many a game of Saga, pitching my Vikings and Anglo Danes against Saxons, Welsh, Irish, Normans and other sundry dark ages types. Saga is a fairly simple game to pick up, but with extra layers built into the battle boards there is great replay value. While it appears to be one set of hairy men with spears fighting against an almost identical set of hairy men with more spears, the battle board mechanics ensure that the opponents are very different - the aggressive Vikings play a very different game to the wary Welsh. I have been thinking about exploiting this feature to design boards for my fantasy forces, but somebody has beaten me to it. Take a look at Fantastic Saga, a set of four boards to play Dwarfs, Elves, Undead and Chaos. Behind the basic website lies a very professional looking set of add-on rules to the Saga ruleset. The free to download pdf is nicely put together, a better effort than many a ruleset I have paid for. The rules are nicely laid out, there's some good quality artwork and everything seems pretty well thought out - admittedly I have read through them just a couple of times and played only one game, but the signs are that it could be my fantasy skirmish game of choice. Our test game took place in Matt's gaming dungeon, pitching Dwarfs against Chaos. We both took a variety of troops, just to see how it played. We stuck with the very simple Kill the Warlord scenario to ease ourselves in. The basic Saga rules are unchanged - roll Saga dice, activate units, give them abilities, accrue fatigue, that's all unchanged. There are additional unit types to cover more fantasy like elements - creatures and contraptions, warlocks, beasts and such like. So the dwarf force included a warsmith (runesmith) and a contraption (bolt thrower), while the Chaos force contained a giant, a troll, sorceror, hounds, ogres. The 10 point forces we used gave a good sized large skirmish/small battle game. The game played out in classic Warhammer style. The dwarf right flank was loaded with missile troops. Buffed by magic from the warsmith, the thunderers and bolt thrower made short work of the hounds and marauders. 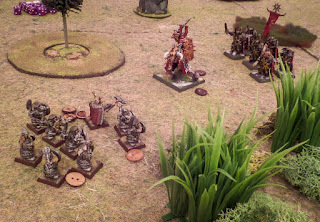 The chaos forces sensibly switched to the other flank, where a unit of ogres and dwarf slayers butchered each other in one gruesome round of gory combat. A giant lumbered in and made short work of dwarf warriors, then set about cutting the dwarf lord down to size (of course there are size puns in a dwarf battle report!). The lord took a terrible beating, but fighting defensively and with his well crafted armour he was able to fight off the giant. His bodyguard flung themselves into the fray and toppled the great beast, though only a third of them survived the fight. In the final showdown the Chaos Lord and his bodyguard squared up to the Dwarf Lord and his bodyguard. It was very close, but the exhaustion from battling the giant told on the stout Dwarf and he fell, broken chaos and dwarf troops all around him. The best thing about this is that the author(s) have obviously spent a lot of time thinking about the game. They clearly have Warhammer backgrounds, the boards really do evoke classic Warhammer Fantasy gaming. Added to that are the usual difficult decision making that Saga games involve. It's certainly a far, far better experience than Age of Sigmar. If you are looking for an alternative fantasy skirmish game, I highly recommend that you give it a try. It's given me an enthusiasm for fantasy gaming that I have not had for a good long while. And that's after just one game! 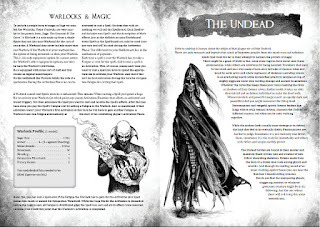 I am eager to try the Elves and Undead boards, while the authors are planning even more boards. 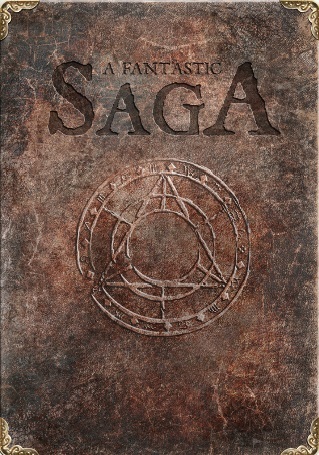 It could well be the start of a Fantastic Saga - watch this space. 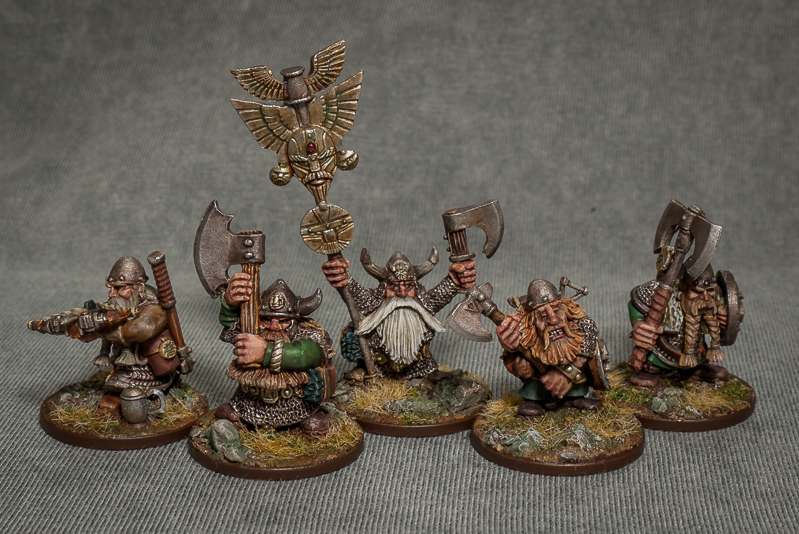 The first of the dwarf rangers are complete. It seems like a long time since I started these figures, my motivation has flagged a little recently so I have found them tough going. This half of the regiment contains a representative selection of the whole unit - metals old and ancient, plus older plastics. Together with the ranger captain that's just half of the regiment completed. The second half I might get finished over the weekend, though it's more likely to be next week. The bases are 2p pieces as explained in my previous post - I have some movement trays ordered so will be detailing those at some point soon. The terrain on the bases was inspired by my local area. 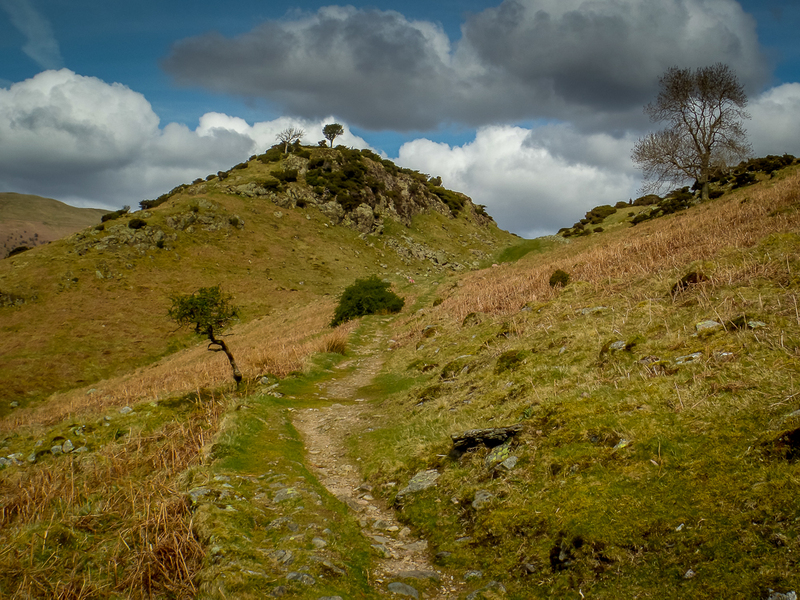 It is hilly, even mountainous in places, and I wanted my dwarfs to look as though they were trekking over land like this. This shot was taken in spring time, the dead grass of winter is still around, with green just breaking through. I decided on spring because I have four main armies on my project list, one for each of the seasons. 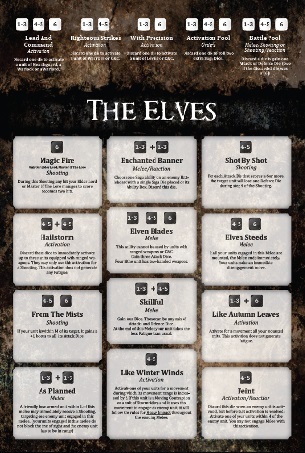 In order of most complete, they are the winter Chaos Warriors, the autumn Undead, the summer High Elves and the spring Dwarfs. Probably not the season most would choose for dwarfs, but it fits for me. 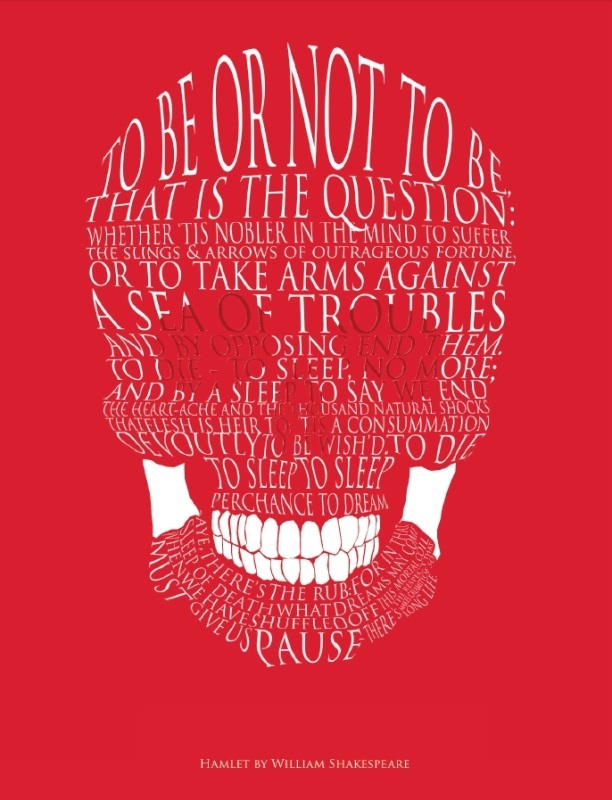 ......that is the question. Admittedly, it's not that much of a dilemma, certainly not in the Royal Danish League, but it has been causing me to ponder a little. 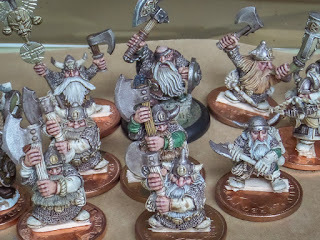 I originally intended to paint the new dwarf army and base them on multi bases, my thinking being that I already have an old dwarf army on single bases, and an upcoming Lord of the Rings dwarf force on round bases, so it would make sense to take a new direction. As you can see from the picture, I have changed my mind. Greater flexibility comes from these 2p bases, which can be used like this in skirmish games and popped into move trays for ranked up gaming, the best of both worlds. With that decision out of the way, I can concentrate on the painting. I have been plodding along with them, in short sessions each weekend. The skin and some beards are pretty much finished, with mail and armour well progressed too. It's all the fiddly bits of boots, belts and kit that remain - these are the things I like to paint the least so inspiration is thin on the ground at the moment. Hopefully I can get them done for month end. It's been quite some time since I played Saga, but over the weekend I joined Matt in his gaming dungeon for a stroll down memory lane. All of our medieval gaming (and even some fantasy gaming) of late has been Lion Rampant, so it would be nice to go back to our roots. I broke out the vikings while Matt had his Normans champing at the bit, a classic Saga matchup. 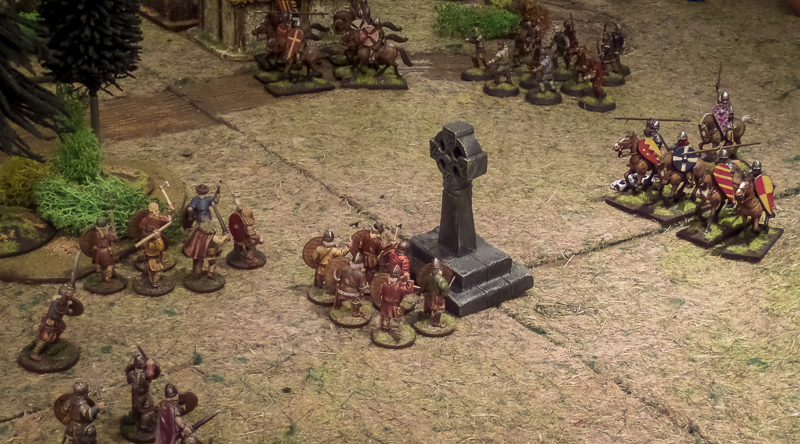 We mixed things up a little by borrowing a scenario from the Lion Rampant rules - each faction would gain a point by holding the cross in the centre of the battlefield at the start of their turn, first to five points would be the winner. 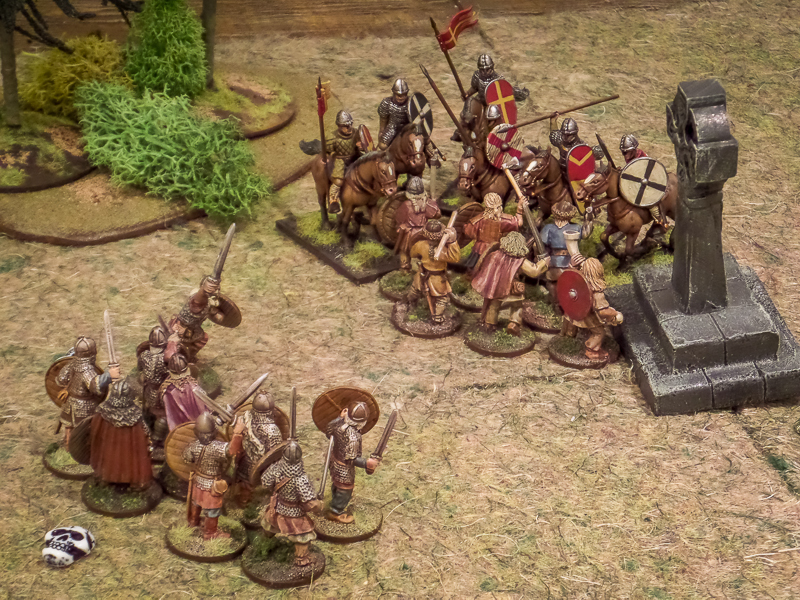 The vikings pushed forward, eager to defile the weak god symbol, but suffered early casualties from a massed Norman knight charge. No matter how many troops they threw at the cross, the Normans found it easy to repulse them with cavalry charges. Eventually, corpses littered the ground around the icon, from both sides. The knights had performed their duty to their god, laying down their lives to drive away the pagan invaders, with plenty of help from the crossbow bolt. Many a viking warrior would revel in Valhalla that night. As with many games of Saga, it ended a bloodbath. Games can be very brutal, especially if the right combinations of Saga dice can be had. The vikings were always on the back foot, having no real answer to the knights or crossbows. The Normans had two units of troops that took no real part in the battle - they won with one hand tied behind their back. Nevertheless, an interesting return to the old game, maybe we will try out some more of the scenarios. 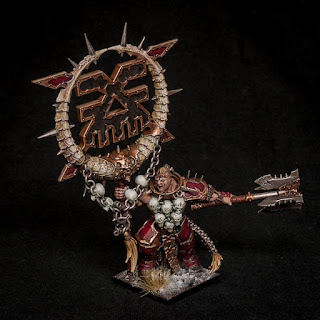 Blood for the Blood God! 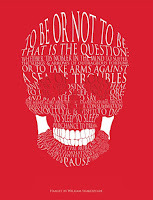 Skulls for the skull, er, vest. Well it is a bit chilly running around in the frozen wastes with your top off. I finally got round to finishing this fine specimen of berserk warrior. The engineering on these plasic figures is still quite amazing to me. The down side to all this lovely detail is that it takes a while to paint up, but it's worth the effort. The colours are the usual suspects of red and brass, with the slightly unusual blonde braids - my thinking was that these warriors are obviously spiky vikings, so it seemed sensible at the time. The trophy braid hanging from the standard belonged to the previous incumbent, a grim reminder of the fleeting glory to Khorne's warriors. With the five previously painted warriors, that gives me enough for a unit in a Dragon Rampant force. There's just the leader to do to complete the armoured contingent of the boxset, then on to the marauders. I am still aiming to have the whole chaos force completed in time for xmas, though the addition of the dwarfs to my painting list has slowed things a little. But I am reasonably confident at this stage that I can get the job done.